Passenbers board the route 75 bus, which goes to Epic Systems in Verona. The growing company has placed a high demand on Metro Transit buses to and from the campus. Every weekday morning, young professionals, many of them wearing ear buds, line up at Madison Metro bus stops throughout downtown Madison to catch the 35-minute ride out to healthcare software company Epic Systems in Verona. 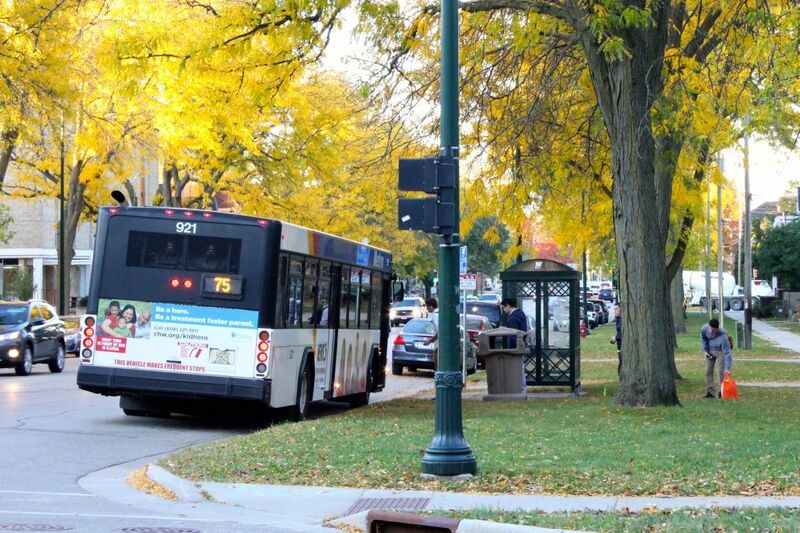 The route 75 bus runs four times each morning, starting with a loop around the Capitol Square and heading down West Washington Avenue to Broom Street, where an orderly line sometimes stretches across the sidewalk and into a neighbor’s yard. By the time it reaches Broom — less than one mile into its route — few, if any, empty seats are left on the bus. The high demand from a growing crowd of Epic employees has left Madison Metro struggling to devise new ways to increase capacity. The problem: there isn't any more space to keep the buses. Madison Metro’s current facility is more than 30 years old and was built to house 160 buses. Right now, it stores 214, along with 17 paratransit vehicles. “Even if [Epic] could buy a bus for us, we’d have no place to put it,” said Madison Metro general manager Chuck Kamp. Metro has applied for a federal Department of Transportation TIGER Grant to build a $35 million bus satellite facility at a city-owned property on Nakoosa Trail on the east side to relieve that strain, and it will hear in October or early November if the application is accepted, Kamp said. Mayor Paul Soglin’s proposed budget has the facility scheduled for construction in 2016, 2017 and 2018. In the meantime, Kamp said Metro is looking for other ways to deal with the crowded buses. Routes 55 and 75 are the two routes going to and from Epic, with 75 offering a faster, more direct route and 55 requiring a transfer at the West Transfer Point to get downtown. Ridership on the two bus routes combined has increased more than 25 percent each year since 2012 and is on pace to do the same in 2015. 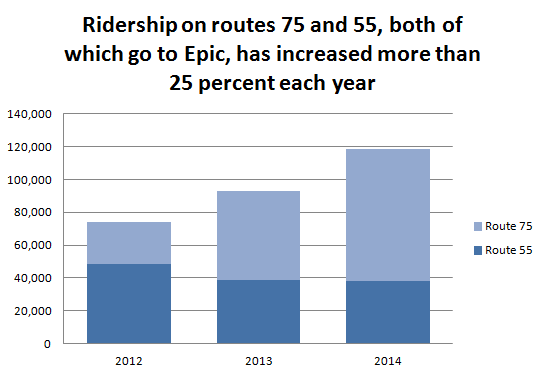 Through August of this year, ridership on route 75 was up 29 percent over the same period in 2014. On route 55, ridership was up 6 percent. That compares to a 3.3 percent increase across the city’s ridership, topping 15 million boardings in 2014. “It’s showing that as Epic grows we need to keep up with their employment growth,” Kamp said. To address the strain, Metro Transit added a bus in late September to the route coming back from Verona at 5:03 p.m.
That bus is one of the first coming back to the garage at the end of the afternoon peak period, a possibility Kamp said Epic asked Metro to explore. Epic quickly approved the extra $26,000 annually that would be required to operate the extra trip, which began operating Sept. 21 and gets to Epic several minutes before the regular bus. Once full, it leaves, and the regular bus pulls up to load. “So far, both of the buses have been completely full as they leave Epic, which indicates that if the capacity is provided, Epic employees will utilize it,” an update to the Transit and Parking Commission said. Kamp said Epic has expressed interest in looking at other morning and afternoon possibilities, but they are currently out of peak-hour bus capacity in both the morning and afternoon peak. “At the time, we don’t have anything that works, but we’re still looking,” Kamp said. Epic could look at running a shuttle of its own, but the company would not comment specifically on that or other possible alternatives. Kamp said Metro will continue to explore alternatives while waiting for a bus satellite facility, with the goal of making sure people have a seat on their bus commute.